Brandon Beane accomplished one of his primary goals last week. By rebuilding his offense through free agency, the Buffalo Bills’ general manager was able to put himself in an enviable position for next month’s NFL draft. Beane doesn’t have to chase a particular position in the first round, meaning he can focus on truly drafting the “best player available.” That’s a line all GMs use, but rarely follow. Beane, though, has that opportunity. The Bills’ list of needs, in no particular order, are tight end, defensive tackle, insurance at edge rusher, and linebacker depth. That gives the Bills options when they are on the clock. A possible replacement for Kyle Williams would make sense. So, too, would a tight end or a pass rusher, with both Jerry Hughes and Shaq Lawson heading into the final year of their respective contracts. The only position that can truly be taken off the board in the first round is quarterback, which is another weight off Beane’s shoulders. 1. Arizona Cardinals. Kyler Murray, QB, Oklahoma. New coach Kliff Kingsbury gets to build his offense around his preferred quarterback. What happens with Josh Rosen in this scenario? 2. Oakland Raiders (projected trade with San Francisco). Nick Bosa, EDGE, Ohio State. The Raiders use some of their draft capital to move up and draft Khalil Mack’s replacement in Bosa. 3. New York Jets. Quinnen Williams, DT, Alabama. An edge rusher could make sense here, but the Jets ultimately view Willliams as too good to pass up. Interior pass rushers are huge for a defense. 4. San Francisco 49ers (projected trade with Oakland). Josh Allen, EDGE, Kentucky. Even after trading for Dee Ford, the 49ers could use more pass rushers. With only six picks at the moment, moving down a couple slots will give them more draft capital. 5. Tampa Bay Buccaneers. Devin White, LB, LSU. After losing Kwon Alexander in free agency, the Bucs find a replacement in the draft. White won the Butkus Award as the top linebacker in the country in 2018. 6. New York Giants. Montez Sweat, EDGE, Mississippi State. Giants GM Dave Gettleman says he has a plan after trading Odell Beckham Jr., but who knows what it is? For some reason, the Giants are still committed to Eli Manning at quarterback, so they take one of the combine’s risers in Sweat. 7. Jacksonville Jaguars. T.J. Hockenson, TE, Iowa. If you’re drafting a tight end in the top 10, he better be the next Rob Gronkowski. That’s a lot of pressure to put on Hockenson, who leads a deep class of tight ends in this year’s draft. 8. Detroit Lions. Rashan Gary, EDGE, Michigan. Defensive-minded head coach Matt Patricia stays in state to add Gary to a defensive line that signed Trey Flowers last week in free agency. 9. Cincinnati Bengals (projected trade with Buffalo). Dwayne Haskins, QB, Ohio State. The Bengals jump up from No. 11 to get ahead of the Broncos, who also figure to be in the quarterback market. New coach Zac Taylor gets a quarterback to build around in Haskins, who is a classic pocket passer. 10. Denver Broncos. Drew Lock, QB, Missouri. The Broncos have been rumored to be enamored with Lock for quite a while. The addition of Joe Flacco in a trade with Baltimore means Lock can sit and learn for a year. 11. Buffalo Bills (projected trade with Cincinnati). 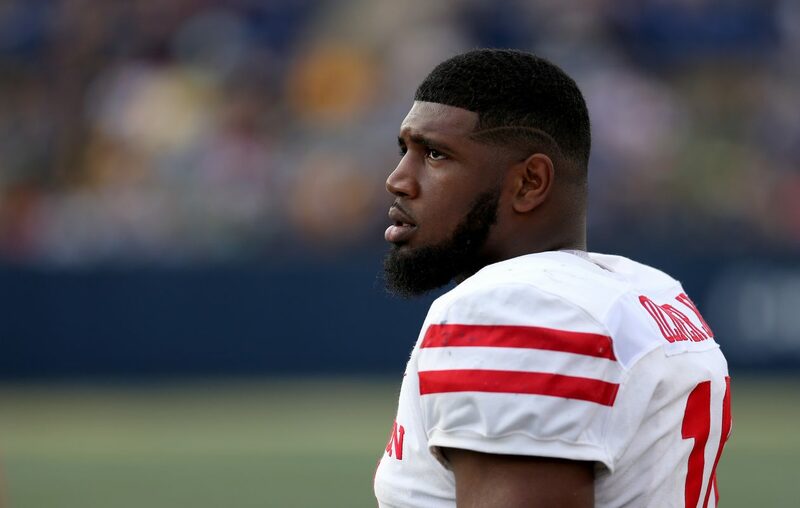 Ed Oliver, DT, Houston. The Bills re-signed Jordan Phillips, but only on a one-year contract, so Oliver could be the long-term replacement for Williams as the team’s three-technique defensive tackle. Oliver was massively productive in college, making 192 tackles (including 53 that went for losses), 13.5 sacks, 11 passes defensed and five forced fumbles in three seasons. He has drawn comparisons to Aaron Donald, the Rams’ star defensive tackle. The Bills pick up a third-round pick to move down two spots – and get the same player they could have taken at No. 9. 12. Green Bay Packers. Brian Burns, EDGE, Florida State. Yes, the Packers signed a pair of pass rushers in free agency, but they can’t pass up on the opportunity to add Burns, who might have the best first step in this draft class. Defensive coordinator Mike Pettine loves to get after the opposing quarterback, and that’s what Burns does best. 13. Miami Dolphins. Jawaan Taylor, OT, Miami. The tank is going according to plan in Miami. The Dolphins signed Ryan Fitzpatrick to be their starting quarterback last week. This pick is who Miami has in mind after Fitzpatrick. Taylor can replace departed right tackle Ja’Wuan James, who signed with Denver. 14. Atlanta Falcons. Christian Wilkins, DT, Clemson. In another draft, Wilkins might be a top-10 pick. He slips a bit here due to the quality of defensive linemen in the class, plus three quarterbacks going in the top 10. 15. Washington Redskins. Jonah Williams, OL, Alabama. We’ll list Williams as an offensive lineman, which speaks to his versatility and the belief among scouts that he could eventually transition to guard from tackle, which he played for the Crimson Tide. 16. Carolina Panthers. Andre Dillard, OT, Washington State. With franchise quarterback Cam Newton coming back from a shoulder injury, the Panthers need to do everything in their power to protect him. That includes using a first-round pick on Dillard. 17. New York Giants (trade with Cleveland). Devin Bush, LB, Michigan. He’s not the biggest linebacker (5-foot-11, 234 pounds), but scouts believe he’ll be a three-down player in the NFL. That’s valuable for a defense. But, still, no quarterback? 18. Minnesota Vikings. Clelin Ferrell, EDGE, Clemson. Another member of the Tigers’ defensive line, Ferrell wins on effort. That should make him a favorite of Vikings coach Mike Zimmer. 19. Tennessee Titans. Dexter Lawrence, DT, Clemson. How good were the Tigers up front? Lawrence is the latest member of the national champions to go in this mock. At 342 pounds, he’s a run plugger first, but can also pressure the quarterback. 20. Pittsburgh Steelers. D.K. Metcalf, WR, Ole Miss. After trading Antonio Brown, Metcalf becomes the first receiver off the board. He blew up the combine with his speed, but there is some concern about his injury history and overall lack of production in college. Still, some team will fall in love with his physical traits. 21. Seattle Seahawks. Noah Fant, TE, Iowa. The second Hawkeyes tight end to be chosen, Fant is more of a receiver first. He played all over in Iowa’s offense, and is disciplined in his route running. 22. Baltimore Ravens. N’Keal Harry, WR, Arizona State. Getting a receiver with a big catch radius makes sense for quarterback Lamar Jackson, who isn’t the most accurate passer. That’s Harry’s specialty. 23. Houston Texans. Greedy Williams, CB, LSU. Williams isn’t the most willing of tacklers, which has caused his draft stock to slip. He’s got plenty of talent, though, and becomes the first cornerback off the board. 24. Oakland Raiders (via trade with Chicago). Byron Murphy, CB, Washington. Williams’ selection starts a run on cornerbacks. Murphy played in just 20 career games with the Huskies, choosing to leave school after his redshirt sophomore season. 25. Philadelphia Eagles. Josh Jacobs, RB, Alabama. He had only 251 carries with the Crimson Tide, but that just means Jacobs enters the NFL without much mileage. He would stabilize a position that has been disrupted since the Eagles traded LeSean McCoy. 26. Indianapolis Colts. Rock Ya-Sin, CB, Temple. A former high school wrestler, Ya-Sin never lost that physical edge. He might need some development time, but has a high ceiling. 27. Oakland Raiders (via trade with Dallas). Miles Sanders, RB, Penn State. Jacobs would have made sense here, but the Raiders passed on him at No. 24 and saw him go a pick later. Instead, they go with Sanders who, like Jacobs, did not have a huge work load in college, carrying the ball just 276 times for the Nittany Lions. 28. Los Angeles Chargers. Cody Ford, OT, Oklahoma. Need and best player available align here nicely for Chargers GM Tom Telesco. Ford could step in as the starter at right tackle. 29. Kansas City Chiefs. Marquise Brown, WR, Oklahoma. With Tyreek Hill under investigation for child abuse – the details of which are disgusting – the Chiefs prepare for what might happen with him by taking Brown, who has drawn comparisons to DeSean Jackson. 30. Washington Redskins (projected trade with Green Bay, pick originally via New Orleans). Daniel Jones, QB, Duke. The Redskins make a move back into the first round to secure their quarterback of the future. At 6-foot-5 and 221 pounds, Jones has prototypical size. 31. Los Angeles Rams. Garrett Bradbury, OL, North Carolina State. The Rams lost guard Roger Saffold in free agency. Bradbury was a center in college, but should be able to move over to guard in the pros. 32. New England Patriots. Jeffery Simmons, DT, Mississippi State. Simmons would have been a top-10 pick before tearing his ACL. That injury likely will cause him to miss the 2019 season, but the Patriots can afford to have him "redshirt" his rookie year.